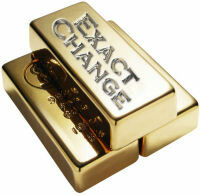 The Exact Change image repository is a great place to store images of the coins in your collection. It's simply a folder that you designate; it can be located anywhere on your drive that you wish. Of course, you can save your images anywhere you want; they don't have to be stored in the directory that's designated as the repository. What does the repository do then? It enables you to easily share images between two or more computers, even if one is a Windows PC and the other is a Macintosh. When you save your collection data, that file doesn't include the images you've attached to coins within your collection. Instead, it saves the location and name of the image file. Under Windows that looks, for example, something like C:\MyCoinImages\US\MyCoin.JPG, while on a Macintosh that may look something like /Library/MyCoinImages/MyCoin.JPG. If you created a coin database on a Windows computer and tried to open that file on a Macintosh, or visa-versa, it would be difficult to match up the coin images. With the repository, Exact Change can easily locate the necessary images. When you attach an image to a coin record, Exact Change will notice that the image is in the repository directory. It will then record the picture's location as something like (Repository)/MyCoin.jpg. 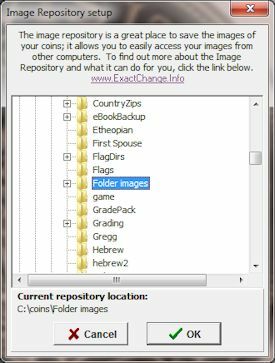 When the image must be retrieved, Exact Change will replace "(Repository)" with the directory designated as the repository. That's a bit technical, you can certainly choose to ignore the repository function if you're working on a single computer. However, it's always a good idea to save your images in a certain directory anyway so that they can be backed up easily. To designate the directory to be used as the repository, just click on the "Image Repository" menu option in Exact Change's "File" menu. To use the repository functionality, just save your images to that directory whenever you add images of your coins. The image repository directory is the default directory displayed when you go to load or save a coin image, so that will automatically guild you toward saving your images in that location. If you decided to change the location where your coin images are stored, for example if you installed a second hard drive and wanted to move your images to it, you can just copy the repository directory to the new drive and then change the Directory that Exact Change is using as the repository. If you're using Exact Change on a network, the image repository can be set to a shared directory so that either computer can access it to display images. Images can be stored in a subdirectory within the repository directory. For example, if you can create a subdirectory within the repository for each family member. Exact Change will still correctly connect the proper images with each coin entry. In other words, any sub-directory within the repository is also considered part of the repository.